Rainbow Manor Wedding Chapel LLC takes care of several wedding services for your big day. In addition to hosting wedding ceremonies and receptions, including decorating, we also offer cakes and catering. Our staff puts creativity and hard work into every cake we make. 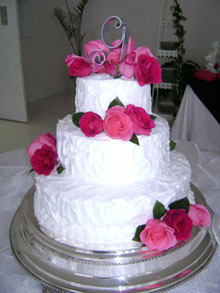 Choose from white, yellow, chocolate, red velvet, and fruit-filled cakes among others. We can make any customized cake you have in mind, drawing out a design or recreating a cake like you’ve found in a photo. We have groom’s cakes available as well. We also bake cakes for birthdays, graduations, and other special occasions. Catering: Rainbow Manor Wedding Chapel includes linens, silver serving pieces, punch bowls, glass plates and cups, forks, and napkins with every catering package. We invite you to bring your own centerpieces or use our silver candleabras. We set up and clean up completely. Our basic package is $10.00 per person and includes the bride’s cake, nuts, butter cream mints, cheese straws, punch, ice tea, and ice water. Additional menu items are priced per person. Our Wedding Services: Rainbow Manor has several features included with our wedding ceremonies, receptions, and preparation for your day. We offer indoor and outdoor weddings. Elegant candlelight with greenery and columns is included in our chapel ceremonies. We have a gazebo surrounded by a courtyard and wooded landscape, where you can use twinkle lights for twilight ceremonies. Dressing rooms are available as well. We can use your CD’s with the sound system or the Roland piano for music, with background music playing inside and outside the chapel and reception room. We offer wedding planning and include an in house director with a one hour rehearsal. We can refer you to florists, photographers, videographers, and musicians. Feel free to bring a photo of a cake for us to create, or choose one of our designs and delicious flavors.Our services offer elegance made easy.